Tuesday Night is Camp Carnival! Tuesday Night is Carnival Night at Oswegatchie! 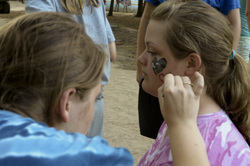 This free form night allows campers to pick and choose what they do for evening activities. Volleyball and Basketball tourneys, fortune tellers, haunted basement tours, and several other "crazy things' going on. Campers can spend their evening with their friends and be as active or relaxed as they want.The evening starts with a cook out and ends with a reflections program performed by the C.I.T.s. Ice cream is available in our camp store scooped by the folks from Good Ol' Wishys. Scoops are paid for by the campers.